UG Commission turns down proposed federal re-entry facility in Fairfax – Welcome to Wyandotte Daily! The Unified Government Commission tonight denied a special use permit for a federal prison residential re-entry facility in the Fairfax Industrial District of Kansas City, Kansas. The Fairfax Industrial Association presented a petition with more than 400 names opposing the re-entry facility’s location at 925 Sunshine Road. The facility would have housed about 85 federal inmates who are about six months away from being released from prison, according to Terry Williams of Re-Entry Development Inc., which was presenting the proposal. Williams is a private contractor with the federal Bureau of Prisons. Williams said they chose this property for three reasons: It was not close to a residential area, it was close to a bus stop, and there were employment opportunities available to people coming out of prison. Several commissioners stated that while they believe re-entry programs are good, they did not believe this was a good site for one. They said the project doesn’t fit with the UG’s plans for the area. The proposal did not have the support of commissioners from the northeast area. Commissioner Gayle Townsend said the proposed site is very close to three northeast area neighborhoods. This project was “out of touch” with what the UG is trying to do with development in the northeast area, she said. Commissioner Melissa Bynum said she believes the northeast area is “fighting every single day for its image.” The commissioners are trying to rebuild trust with the community, she said. Other speakers said what the northeast area residents really wanted was a grocery store, and some retail development. Elnora Jefferson spoke in opposition to the project in its current form, and outlined the benefits and drawbacks of the project, after discussing it with many community residents. There was a feeling among some people that the facility, if it is approved, should provide better lighting and security for the area, and that the city should provide a satellite police station close by. Victor Harris, president of the OCP Neighborhood Association, said there are already a number of halfway houses for various purposes in the area, and while he is not against them, he did not see why the northeast area should be the only area with them. He suggested moving some to the west side of town. “Just move it to another location, we have enough,” he said. Joe Vaught, a former commissioner, also said there were a lot of residents around the proposed location. The nearby Parkwood Park is frequented by a lot of children, he said. As a real estate broker, he said he would be obligated to tell prospective Fairfax tenants that there is a re-entry site nearby. There were also Fairfax businessmen, including those who had family businesses, who said they were afraid of their property values declining if the re-entry facility were approved. Under questioning from Commissioner Brian McKiernan, Williams said that there is currently a federal re-entry program being operated in the Leavenworth, Kansas, area by another private firm. The inmate program, if it receives the contract from the Bureau of Prisons, would be moved from Leavenworth to the Fairfax area, according to Williams. It is a competitive bidding situation, she said. Leavenworth, Kan., is about a 40-minute drive from Kansas City, Kansas, approximately 34 miles away (or about 17 to 20 miles from western Wyandotte County). The vote was 8-1 against the proposal. Hal Walker, who is not running for re-election this year, was the lone commissioner voting in favor of the proposal. Also in favor of the proposal was Mayor Mark Holland, who did not vote on it. Walker noted there were more than 1,000 people now in Wyandotte County under some sort of supervision, including 185 federal parolees, as well as people who are state parolees and more who are under community corrections. “I think this is a great proposal,” Walker said. He said he believed the Fairfax area would benefit from it. Mayor Holland said there are probably 100 ex-offenders working in the Fairfax area now. He said these sorts of facilities are often emotional issues, and that it is overblown. He does not believe the data supports increased crime around these facilities. He added there was a crisis in Wyandotte County with people returning from jail without training, job prospects or transportation, and this program could help them. 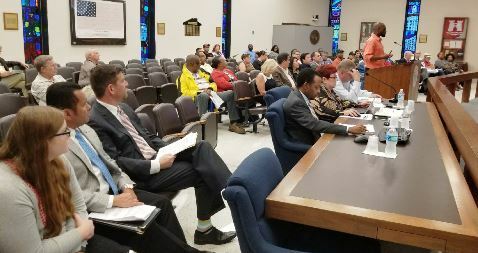 The re-entry facility earlier had the unanimous support of the Planning Commission, so at least 8 votes were required to overturn that decision. Steve Dailey, representing the Fairfax Industrial Association of Kansas City, Kansas, said that there were more than 120 businesses with $4 billion plus in investment and 10,000 employees in Fairfax. Commissioner Townsend said the Fairfax district is No. 2 in the city in terms of the tax contributions they make, second to the Legends area. Dailey asked that if the project were approved, the facility be required to provide transportation and security to and from any businesses that the inmates visit, and that they not be allowed to walk alone to a business without an appointment.